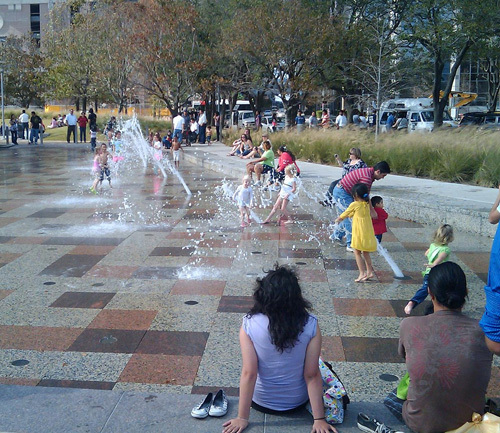 Discovery Green has not only become a popular place for locals but has also spurred numerous downtown development projects. Flickr photo by kalebdf. Despite Houston’s enduring image as a downtown office park where every project strives to be bigger and glitzier than anything that came before, the city is now focusing on creating lively new public spaces. This important shift is occurring in other Texas cities too, infusing downtowns and neighborhoods with a new sense of vibrancy and, most surprising of all, doing it by working at a smaller, human scale. 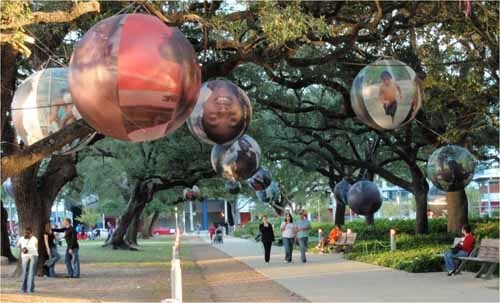 Houston has become a hot-spot by turning its planning process for public spaces upside down. Instead of using a project oriented and design-led approach, it is using a bottom up Placemaking approach. The vision for a public place is now defined by stakeholders in the community with leaders and professionals helping to implement this vision. This approach is already paying off—downtown Houston is thriving from hundreds of millions of dollars in new investment and never before have so many come downtown to enjoy the new amenties. We’re not the only ones to take notice of what’s going on in Houston. Recently Fast Company named Houston its “City of the Year”, citingDiscovery Green as “a symbol of the new Houston.” Cities all around Texas (and soon, we hope, the country) are finding ways to follow suit. 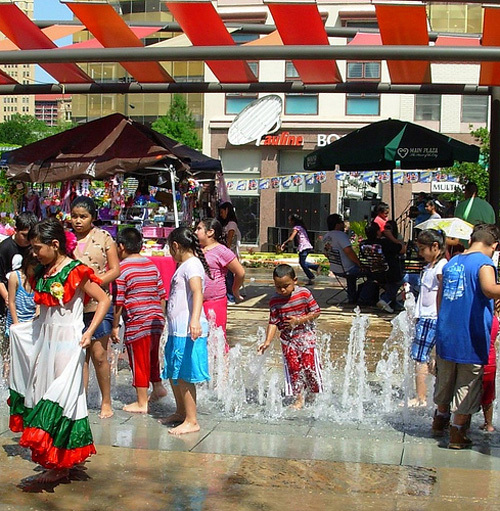 Here are stories of some significant Placemaking projects in Texas created with PPS’ help. As part of the community’s vision, the existing allee under the live oaks is used as a place for sitting, exhibits and people watching. The vision for Discovery Green in downtown Houston across from the George R. Brown Convention Center, was that it become a lush, beautiful, actively used park: a “Community Backyard for the 21st Century.” The concept was developed as a groundbreaking planning model in which the community was the expert who defined the vision and professionals and consultants became resources for enabling that vision to become a reality. Discovery Green opened in the spring of 2008 and soon became a magnet destination. It is estimated that more than 2.3 million people have now visited this unique public space and that the park has catalyzed nearly $1 billion dollars in nearby development, showing how Placemaking pays off. A number of residential and commercial projects have specifically noted Discovery Green as the impetus for their investment. For details, check out PPS' new economic impact case study of Discovery Green which includes detailed visitor data and information on public private partnerships. The management plan for Market Square Park ensures that there are many opportunities for people to sit and eat. PPS calculates, based on decades of experience, that 80 percent of the success of any public space is due to how it is managed. Market Square Park, in the center of downtown Houston’s Historic District, re-opened in August of 2010 after many years of disuse and a great deal of debate about what should be done to revive this public space. 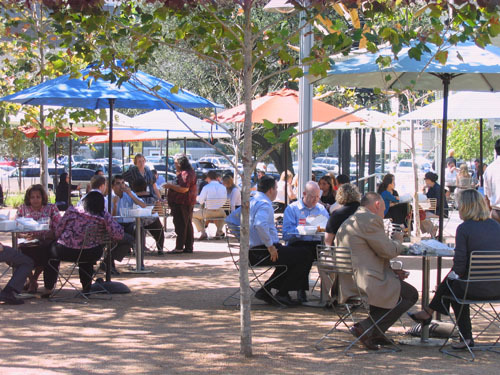 Houston Downtown Management District (Downtown District), also involved in Discovery Green, worked with PPS to facilitate a Placemaking process to develop new ideas for the place. The Downtown District then guided the translation of the stakeholders’ vision into a design and management plan for the square. The core of this vision was to ensure there is something to do in Market Square Park all times of day and evening. It features a very popular Greek outdoor café with dining trellis, water features, artwork, two dog runs, a variety of places to sit, eat and people watch and neighborhood-friendly programming such as movies and live music. The square has become a popular destination for visitors, but more importantly, it has become a beloved gathering place for local residents. Several new neighborhood parks in Houston have been conceived as community gathering places in Houston, offering examples-in-action of why creating a “place” is more important than a design. The central open space has now become the “town square” and main gathering place at the Baker Ripley Community Center. Flickr photo via Neighborhood Centers. The vision for the Baker Ripley Neighborhood Center emerged during PPS’ work with Neighborhood Centers Inc., which engaged citizens of this largely Latino neighborhood. The Upper Kirby Civic Center Complex will have a variety of destinations within it including a café, a community garden and farmers market which will furnish some of the food for a new café, play area, performance space and more. The Upper Kirby neighborhood in central Houston has steadily attracted residents and businesses in recent years. The communityhas long been working to create a civic and cultural hub to make the site a destination for people from across the city but when plans for a YMCA and a theater fell through, many residents were frustrated. What they didn’t realize was that the community itself held the answer to its future. 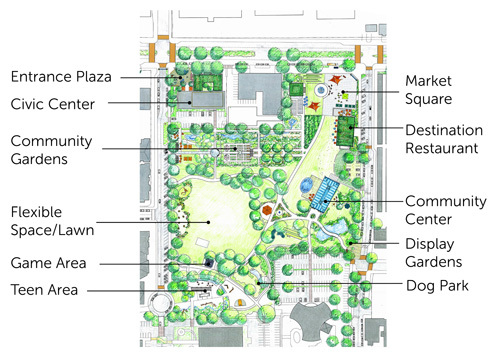 PPS developed a community-driven plan for programming the civic center complex as a vibrant public space in itself that would connect to nearby Levy Park and its active community garden. Another important part of the community’s plan was to link bike and ped paths and the new rail station. The site was cleared of derelict multi-family buildings which created the space and opportunity to expand Levy Park and make a central park for the neighborhood. Based on this vision of a civic center complex, a focus on sustainability and environmental issues will create a strong identity for the area by expanding the existing community garden, creating interactive water features for children to enjoy, relocating the Urban Harvest farmers market to the civic center, and attracting a destination restaurant that will source its food from the garden and market. Work continues on Emancipation Park, envisioned as both a neighborhood park and a major destination celebrating African American history in Houston’s Third Ward; and on the Sister Cities of Houston International Promenade both of which PPS has been honored to be involved in. Cities around Texas are turning planning upside down. Here are some extraordinary Placemaking stories from around the Lone Star state. Corpus Christi: "If the People Lead, the Leaders Will Follow"
Change in Corpus Christi is coming from the citizens who have organized themselves to turn their waterfront around. “If the people lead, the leaders will follow.” Often attributed to Gandhi, this powerful phrase sums up the amazing effort that has been undertaken by a small group of committed Corpus Christi residents who have begun to turn around their waterfront, and their city. It is truly one of the most extraordinary Placemaking efforts of its kind in the country. It started with a group of citizens who knew something needed to be done to make their downtown waterfront an attractive destination. They developed a presentation about successful public spaces and began to show it to small groups throughout the city to get ideas for what their waterfront on the Gulf of Mexico could become. 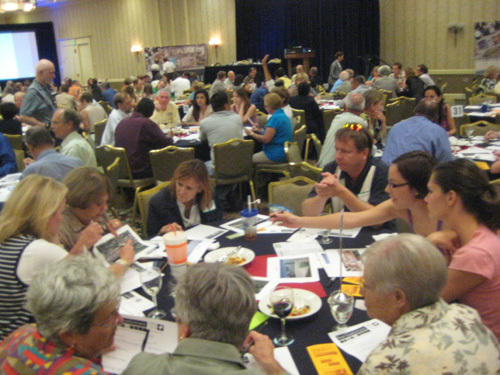 Texas Architect magazine devoted its July-August 2011 issue to Placemaking and reports on the remarkable story of community involvement in Corpus Christi in which more than 2,500 community members participated in over 80 public meetings. Their input was incorporated into a new vision for the waterfront. Read morehere. A concept for a series of new public spaces along the waterfront, including a zocolo square, public market and performance area, was developed, the citizens set up a not for profit called Destination Bayfront to continue the work. The community and City of Corpus Christi are now working together to make the vision and the dream a reality. Byembracing citizen-led change, this community in beginning to turn its waterfront around. One of the many submissions to PPS’ Digital PlaceMap for San Antonio came from Meredith in Vance Jackson who included this image of the shade structures in downtown's Main Plaza as an example of the kind of shade she’d like to see more of in her city. Flickr photo via arellis49. Leaders in San Antonio are taking a holistic approach and undertaking a city-wide effort to employ Placemaking to generate interest and ideas for improving downtown San Antonio, especially for local residents. Central to this is PPS' new Digital Placemaking service centered around the PlaceMap which is being used to help crowdsource ideas from the local community about needs and opportunities, increase engagement in the downtown public planning process, and inform strategic decisions about the downtown. Piloted in Baltimore and Denver, integrating PPS' Digital Placemaking enhances overall Placemaking efforts and helps turn any set of projects into a hybrid online and offline grassroots planning campaign. The team at San Antonio's Center City Development Office is embracing this innovative online and offline engagement strategy for their downtown revitalization efforts, further realizing their mission to "foster thriving neighborhoods." Main Plaza, recently named by theAmerican Planning Associationas one of the US’ great public spaces, is one of the city’s great public destinations. Other destinations around San Antonio are also beginning to blossom- HemisFair Park and St. Paul Square, could join Pearl Brewery as important multi-use destinations in San Antonio. 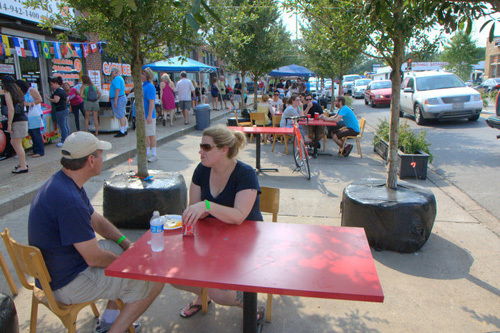 One lane of traffic was removed and a “pop-up” plaza was created with temporary seating, potted trees, and a food truck where people come to eat, meet and socialize. Photo via Go Oak Cliff. The Better Block Team is an organization behind some of the best examples of community-led "lighter, quicker, cheaper" approaches to improving public spaces in Texas today. It all started when citizens in the Oak Cliff neighborhood in Dallas were concerned that streets in their community were unsafe for pedestrians and were not as alive, active or engaging as they could be. Spearheaded by Jason Roberts, neighbors took matters into their own hands and held a community-led “right-sizing” event in April 2010. They re-engineered a blighted block in their neighborhood, taking one car lane away to create cafe seating, using another lane as a European styled bike lane, and turning a third into parallel parking. Three nearby vacant building spaces were transformed into space for coffee shops, gift markets, and a kids art studio. As they describe it, “The ‘Better Block’ project is a demonstration tool that temporarily revisions an area to show the potential to create a great walkable, vibrant neighborhood center. The project acts as a living charrette so that communities can actively engage in the ‘complete streets’ buildout process and develop pop-up businesses to show the potential for revitalized economic activity in an area.” Several pop-up businesses that we created with the community are now permanent, showing it possible to use the better block process as a business incubator for small start-ups. For more about the Better Block project, check out this great video. More than one-time events, these experimental changes to a community’s streets and plazas are part of a larger planning process to create more livable streets. There have been more than 15 Better Blocks that others have now undertaken in places including: Memphis, Houston, St. Louis, Tulsa, and Cleveland. The Team has also worked in downtown Dallas, where short-term, high-impact changes to the City Hall Plaza were inspired by plans William H. Whyte created for the space more than 30 years ago. Check out this videoof the plaza transformed. So, how can you spark a Placemaking movement in your city? PPS has a number of tools, strategies, and approaches you can use to kick off a Placemaking Movement your neighborhood and city. The Power of Ten can be a framework to elevate Placemaking to a neighborhood, city or regional level. The Place Performance Evaluation Game is a tool we use in workshops around the world helping people assess any place, good or bad. Lighter, Quicker, Cheaper describes a hyper-local development framework that is lower risk and lower cost that capitalizes on the creative energy of the local community and that efficiently generates new uses and revenue for places in transition. How can PPS help you on a project? Email us: projects@pps.org.